They were portrayed as a sacred mission to reclaim the Holy Land – Jerusalem. However, as most things are, there is more to it than that simplistic portrayal. So, what were the crusades? They were portrayed as a sacred mission to reclaim the Holy Land, Jerusalem. However, as most things are, there is more than that simplistic portrayal, especially in its impact on the lives of the people of the times. The crusades are important to understand due to the vastness of its impact on the lives of different groups of people, and the remainder of this post would focus on explaining how the crusades impacts these various groups of people by first briefly summarising the first four crusades and then discussing their motivations and consequences. The First Crusade (1095–1099), was called for by Pope Urban II in 1095 to aid the Byzantine Empire who had recently lost land to the Turkish Muslims who (according to Thomas Madden’s The Concise History of The Crusades), had been committing sacrilege against Christian artefacts and followers. (“The Council of Clermont”, p8.) Reclaiming the Holy land, Jerusalem, was also part of the agenda. The first crusade was successfully mobilised and ended with the re-establishment of Christianity in the lands the Byzantine Empire had lost, including the prized Jerusalem. The region was then split between the crusaders to create the Crusader states, also referred to as the Latin States. In 1144 CE, a crusader state by the name of the Country of Edessa fell to a Muslim civilisation called Zengi. 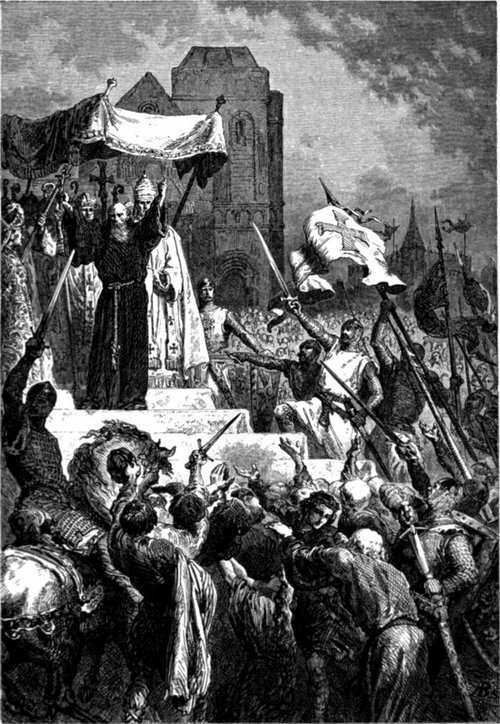 This gave impetus to the second crusade, instigated by Pope Eugenius III and St Bernard of Clairvaux gain; there were similar sentiments of preventing a Christian land from falling into the hands of heathens. This crusade was the first crusade to be led by European kings, namely Louis VII of France and Conrad III of Germany. However, the crusade was plagued with disagreements between its leaders and had an unclear goal. As a result, instead of responding to the loss of the Country of Edessa, the army attacked their ally Damascus. The crusade ended ultimately with a Muslim win, further division within the Christian states and eventually the fall of Jerusalem. 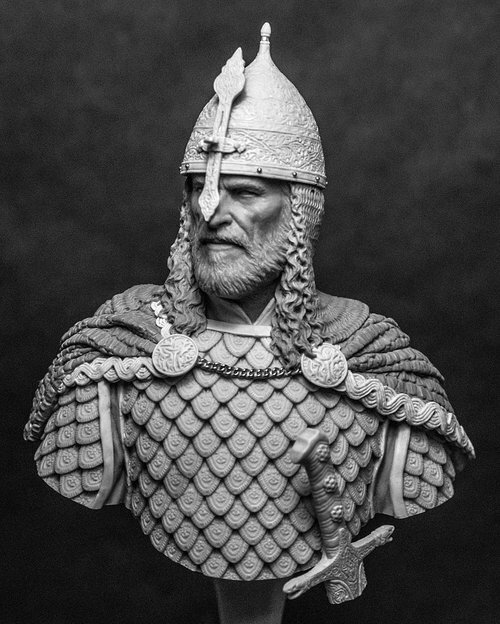 A sculpture of the influential Islamic military leader, Saladin. The Third Crusade (1189–1192), also known as The Kings’ Crusade, was focused on reconquering the Holy Land from Saladin, a military leader who unified Muslim forces in Egypt and Syria. Saladin had reconquered almost every Crusader city and built a powerful base dangerously close to the Christian Roman Empire. Upon hearing this news, Pope Gregory VIII called for a new crusade to the Holy Land. Three powerful kings heeded the call: Emperor Frederick Barbarossa of Germany, King Henry II of England and King Philip II of France. Unfortunately, two of them died – Frederick Barbarossa and Henry II of England (who was succeeded by Richard the Lionheart). The fighting reached a stalemate, and a compromise was reached; the Ramla Reconciliation, signed in 1192 , granted safe passage for Christian pilgrimages through the Muslim land of Tyre to Jaffa. While the campaign was successful in capturing the important cities and reversing some of Saladin’s conquests, it ultimately failed to recapture Jerusalem. You may have guessed this! This crusade was called for yet again by a pope (specifically Pope Innocent III) with the intention to reconquer Jerusalem from Muslim rule. However, following the trend, the crusade failed as the army lost their initial goal and ended up occupying Constantinople, the capital of the (Christian) Byzantine empire. This mess was brought about by hidden agendas and with politics masquerading as piety. The Crusaders looted and razed cities, including Christian ones. These side missions occurred despite veto from the Pope and were to raise funds to repay Venice for the loan of fleets and to fuel the Crusade. Many also broke their vows to respect the women of Constantinople and assaulted them. The fighting and instability in Constantinople prevented Crusaders from furthering their journey to Jerusalem. A drawing on a French manuscript depicting the Fourth Crusade where the crusader army invaded Constantinople. / Geoffreoy de Villehardouin. Crusaders invading Constantinople. (circa 1330) from La Conquête de Constantinople. Public Domain. The events above are important in history but it does not get into the details on why the crusades were impactful to the people involved or affected. To do this, we must examine the motivations and consequences of the crusades on the instigators (which were the political and religious leaders), the crusaders, and the people outside the church. The cause of the First Crusade was mostly religious but it also had political agendas from many players. Pope Urban II preached a “holy war” as pilgrimages were difficult due to Muslim control over The Holy Land and its surrounding areas. He claimed that it was fulfilling god’s duty to upkeep peace and maintain the laws of the church(University of Pennsylvania, (II ed.) pp. 4-5). However, according to Thomas Madden’s The Concise History of the Crusades, the Pope’s call to arms was also to consolidate the power of the Latin Church throughout Europe due to the continuous disputes between him and the political rulers arguing the limits of the Church’s authority. These were worsened by the papal income tax imposed by Pope Innocent III in 1191 (“Chapter 3 The Great Princess”, loc. 50-51) where 2.5 percent of annual revenue was, collected solely from the people. This was ostensibly to fund the crusade, but was used for the Pope’s personal spending which worsened the infighting. Helping the Romans and Byzantines with the Muslim threat aided the Pope in uniting with political leaders to fight a common enemy. It arguably helped to solidify the pope’s control over the Church (“Holy War, Holy Land”. p264). The crusades were also a great wealth generator for the political leaders. After the first crusade, treaties were made with the Byzantine Empire which gave Italian merchants control over crucial cities within trade routes in the Eastern Mediterranean. 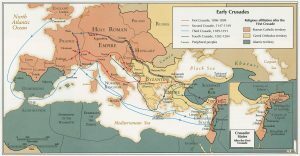 Furthermore, the conquests that occurred in numerous Mediterranean islands ensured Christian control of these trade routes, and occupying cities proximal to Damascus, Baghdad, and Alexandria also granted access to their profitable resources (e.g. spices). In any war, casualties are usually expected in both ends, more so for ancient battles which have high death tolls. Considering this, why would anyone “take up the cross”? According to Privileges Granted by Eugene III, those who joined the crusade would be forgiven of all sins “with almost no cost to them”. (Urban and the Crusaders”, loc 23.) Crusaders would also receive plenary indulgence (Pp 1-23) which were, according to The Enchiridion of Indulgences, “ the remission(s) before God of the temporal punishment due for sins already forgiven as far as their guilt is concerned.’ (“Three General Grants of Indulgences,” loc. 11-16) In other words, they would be given permission from the church to sin unlimitedly during the crusades, probably to protect them from divine consequences of murdering heathens. However, this gift ended up misused as the crusaders were known to loot, raze religious sites and brutally attack other cities that were unrelated to the goal of the crusade. Finally, they were promised eternal life, the ultimate goal in the Christian path to salvation. These rewards were probably more appealing as they were more immediate than rewards that could only be received after death. Firstly, the crusaders were allowed to keep the plunders from their conquests. Looting was arguably a large incentive as according to Ivan Lindsay’s History of Loot and Stolen Art: from Antiquity until the Present Day, “looting was high” on the agenda of the main crusade led by Raymond IV of Toulouse. The crusaders also eradicated and looted the cities of Sozopolis, Iconium, and Caesera even though they were not part of the Holy Land but merely on the way to it, suggesting that many crusaders laid not up for themselves treasures in heaven, but on earth. Secondly, in the second crusade, the crusaders were promised protection and security from the church. This absolute protection extended to their family, possessions and property, which would be very securely under the shelter of the church authorities. Also, the church promised clearing the individual of all debt, a very appealing boon even until today. They were allowed to mortgage their lands and possessions to the churches and those related to the churches. They also were exempt from taxation. So far, we have talked about the impact the crusades had on the people on the side of the church. So what about the ones who are not on the churches’ side? The crusades affected the people in Jerusalem greatly, of which a large number were Muslims. A great unknown number lost their lives in battles and massacres. An anonymous writer connected with Bohemund of Antioch wrote the Gesta Francorum et aliorum Hierosolymytanorum (The Deeds of the Franks). This text was used by the later writers as one of the most important primary sources of the First crusade. It states that, “…the slaughter (which happened when the Muslims were seeking shelter in the Temple Mount inside Al-Aqsa Mosque) was so great that [their] men waded in blood up to their ankles….”. The Crusaders also “destroyed shrines, killed nearly all the city’s inhabitants, burned copies of the Qur’an”, says historian Ibn Muyassar (cited in Hillenbrand’s The Crusades – Islamic Perspectives, p66). Many historians agree that the succession of crusades deteriorated Muslim-Christian relations and disrupted the region’s peace. However, not all impacts were harmful. For instance, there was an exposure to new weapons and military ideas. These, which they began to adopt after the first crusades, aided them in the subsequent ones. Furthermore, Muslim merchants earned wealth from trade with Europe, which helped them to fund new mosques and religious schools. The Jews are, although a minority group in the big picture of the crusades, an important community to take note of in the crusades due to their significant long relationship with Jerusalem, their spiritual capital (it held many Great Temples such as The Temple of Solomon) until they were forced to leave. Although the Jews were not directly involved in the crusades, they were still heavily affected by them. During their pilgrimage, the crusaders passed a few Jewish communities. These communities existed along Germany of Speyer, Worms, Mainz, Rhine and Cologne (pp 9-10). The crusaders decided to force the Jews to join the Crusades or be killed, probably thinking the Jews would willingly join them because of their strong identity with Jerusalem. However, the Jews disagreed as they couldn’t justify attacking Muslims in Jerusalem while they were tolerant of Muslims living among them undisturbed. To solve their predicament, most of the Jews chose an honorable suicide, “Kiddush HaShem” (sanctification in the name of God by being holy). They killed their own family members with their own hands before taking their own lives. The ones who did not choose this were branded as traitors and killed by the crusaders. Clearly, the crusades impacted the lives of all populations mentioned earlier – where lives were either ended, made worse or made better. It may not seem important to us now, but it was a huge event that we cannot be ignorant of. War fueled by a religion – or any war – brings out the best and worst in people. People brought up with strict pacifist morals were suddenly looting, assaulting, and killing. Ideas and technology were shared, but at the cost of many lives. From a strategic perspective, the crusades were messy mostly failures. Parallels can be drawn to current world events, so as not to repeat the past. Allen Barra. (2016). New Saladin bio shows sultan’s unifying powers during Crusades. From Chicago Tribune. Accessed June 2016. Duncalf, Frederic. The Peasants’ Crusades. (1921). The American Historical Review, Vol 26, No.3: 440-453. Oxford University Press. JSTOR. Accessed April 2018. Encyclopedia Britannica. Siege of Edessa. Accessed March 2018. Encyclopedia Britannica. The First Crusade and the Establishment of the Latin States. Accessed March 2018. Encyclopedia Britannica. The Fourth Crusade and the Latin Empire of Constantinople. Accessed March 2018. Joseph Cardinal Ferretto. The Enchiridion of Indulgences. (1998). Sacred Apostolic Penitentiary. Accessed April 2018. Lette, Rickie. Cultural Exchange in the Crusader States in the High Middle Ages. Academia.edu. Accessed April 2018. Levy, J. (n.d.). How the Crusades Affected Medieval Jews in Europe and Palestine. Accessed April 2018. Lindsay, Ivan. The History of the Loot and Stolen Art: from Antiquity until the present day. (2014). p15. Unicorn Press Ltd. Accessed April 2018. Madden, Thomas. The Concise History of The Crusades. 3rd ed. (2014). Accessed April 2018. Mathews, Rupert. (n.d.). Siege of Damascus 1148. From Encyclopedia Britannica. Accessed April 2018. Moore, John C. Pope Innocent III: To Root up and to Plant. (2003). Google Books. Accessed April 2018. Porges, Walter. The Clergy, the Poor, and the Non-combatants on the First Crusade. (1946). Speculum, 11: 1-23. University of Chicago Press Journals. JSTOR. Accessed April 2018. Rooney, Rachel. The Crusades: Motivations, Administration and Cultural Influence. The Newberry. Accessed March 2018. Throop, Susanna. The Impact Of The Crusade. From Khan Academy. Accessed March 2018. Unification: Saladin and the Fall of Jerusalem. (2016). Al Jazeera. Accessed March 2018. University of Pennsylvania. Privileges granted by Eugene III from Translation and reprints from the original sources of European history. (1894). Edited by Munro, Dana. Vol 1. ed II. p13. Accessed March 2018. University of Pennsylvania. Speech of Urban II at the Council of Clemont from Translations and Reprints From the Original Sources of European History. (1894). Edited by Munro, Dana. Vol.1. ed II, pp 4-5. Accessed March 2018. Originally published by Hello World Civ under a Creative Commons Attribution-NonCommercial-ShareAlike 4.0 International license. This entry was posted in Crusades, History, Medieval, Middle Ages. Bookmark the permalink.